As wtitten in the back of the original picture: "By virtue of their recent win over the Illinois Athletic Club, the Water Polo team of the Los Angeles Athletic Club has been chosen to represent America in the 1932 Olympics. Above are members of the team in Los Angeles. 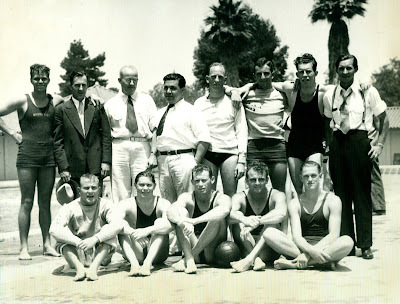 Rear row L-R: Frank Graham, Clyde Swendsen, Head Swimming Coach of the Los Angeles A.C.; Les Henry, Manager, Frank Rivar, assistant Coach, Charles Finn, Joseph Knapp, Gal Strong, Harvey Walters, business Manager. Front row L-R: Austin Clapp, Charles McCallister, Walter (Wally) O’Connor, Captain Philip Daubenspeck, Herbert Wildman." Source: Photo ACME news, 26 July 1932.